Falling asleep at your desk again? Rooney leaves for Dzeko and Lacazette. Very fair deal IMO and I needed an extra striker since Di Natale was my only option after Rooney. On look out for a new Central defender can use CLICHY, OSVALDO & FIRMINO in deal can use 2 or all 3 of them for right player, looking at 91+. Sean McEvoy (wolfy102 Forum) is after a new challenge and so has resigned as manager of AC Milan. Surprised to see this message this morning..
will look to get the vacancy filled ASAP. Also as the season draws to a close we should discuss what rules to bring into next season to liven up activity in the world. That's good news, but it's a shame to see Sean leaving tho. Think we need the Internal Deals and that U21 Talent rule back..
quiet happy with internal deals but i know i few managers were unhappy with it last time, but then if they dont post then tough! SSC Napoli beat Manchester United 2 - 1 in their Division 2 fixture. Volland scored a goal and was later voted Man of the Match for his performance. Barzagli was also on the scoresheet for his side. By beating United we secured a playoff spot to division 1 in the last round! The match ended 2 - 2 between Juventus and Bayern München in their Division 1 fixture. Silva was on the scoresheet for his side. In a game where Juventus must win to be able to get the title,the team worked so hard to get it. De Rossi made crucial mistake when scoring own goal,but David Silva gives hope by scoring brace to give Juventus lead but Bayern work as hard as they can to secure the title and Schweinsteiger goal is enough for them to secure the title. Sean is a great guy and a trustworthy manager. I hope everything is okay with him. I like the internal deals' rule, Steve. If I'm not mistaken, I've made at least 3 deals every season (even in the ones where you didn't need to). I hope the TBs on players, I signed this season, don't get in the way of possible deals for season 6. If there is vacancy, I would like to join this setup. Steve get him in!! Tried for 4 Nations but I got rejected . In other news, Real Madrid don't finish bottom - you lot better watch out next season - I smell treble coming my way! I see that Spider-Man applied for Milan! Wouldn't mind having a superhero onboard. Shakhtar Donetsk slumped to a 1 - 0 defeat against FC Porto in their Division 2 fixture. with the power house teams. Leverkusen remain in Division 2! last night and finished the season on sixth place in Divison 2! while Sanchez was on the score sheet for Dortmund. 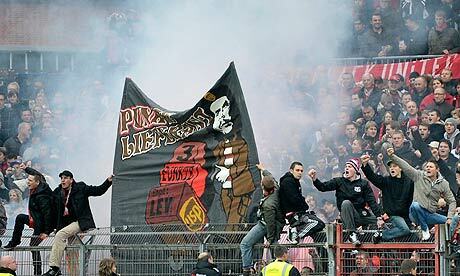 Thousands of Leverkusen fans traveled to Dortmund for this match. You offered the job when I was getting ready for my final exam, so it's kinda hard. And seems like you gathered enough interest in that setup of yours too. You offered the job when I was getting ready for my final exam' date=' so it's kinda hard. And seems like you gathered enough interest in that setup of yours too. haha you broke my heart V!!! Nah nothing set at the mo, like you set gotta decide for next season. I think picking an u21 or two to play a set amount of games in the season is a good rule to bring back. Internal transfers were fun but everyone needs to be on board. I'd vote yes to both if we can all agree. U21 Player must play 5 games for club. 3 internal deals is a must in my opinion. Everyone happy with these two? Yeah fine with me! Do the 3 deals start from now??? Newly rising young manager Van Klinkert Delarosa has taken charge of #weareacmilan after the departure of Sean McEvoy. Van Klinkert Delarosa is said to be relishing the opportunity to develop his football management skills at San Siro and the Rossoneri supporters are sure to be hoping he can make a difference to their team. Media was fast to get on the back of the young manager and questioning his management crediantials, but with the backing from the club's board and vast majority of Rossoneri supporters; Van Klinkert Delarosa was tipped to brings success to this club. Wait for the ingame season to tick over first.